"I'm watching Tour de Yorkshire", announced dad when I called him the other week. 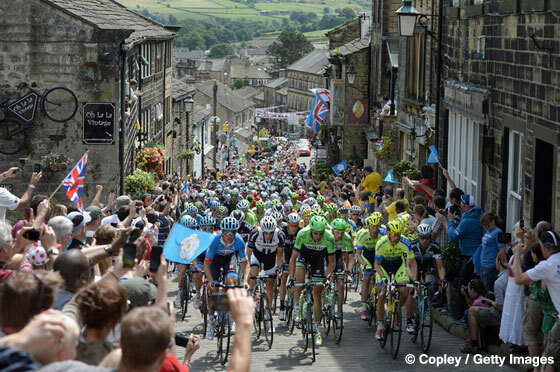 Tour de Yorkshire? Eh, up. Maybe that recent fall he had was more serious than we thought? 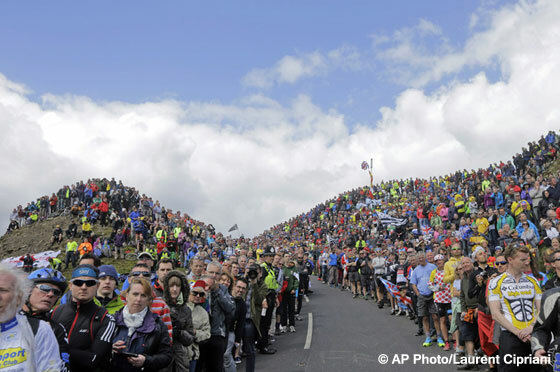 But no, turns out that the Tour de France organizers this year chose Yorkshire - the most northern point in the history of the 111 year-old sporting event - for the first leg of the race; otherwise known as the "Grand Depart". 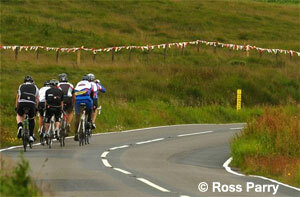 The world's greatest bike race kicked off in what is commonly known as "God's Own County". Picture-postcard villages, Norman churches, rolling hills a dozen shades of green. Cecil B de Mille couldn't have produced a better backdrop. Nor could he have expected a better return on his investment. 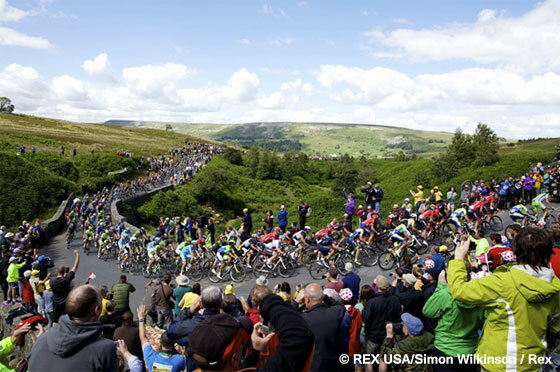 For the equivalent of about ten to fifteen million dollars, the Tour de Yorkshire was expected to net somewhere in the region of a hundred and fifty million dollars. 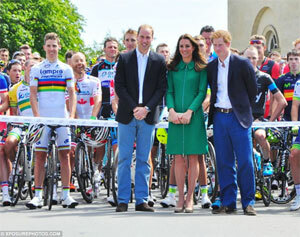 William, Kate & Harry at the ribbon cutting ceremony. Tickets to the opening event in Leeds were about £85. Roughly the price of a standard concert ticket; that's not so bad for a world class sporting event. Excepting the event is generally free of charge. Mugs. No not the people who brought tickets at that price, but the kind one drinks out of, were just one of the items of memorabilia that could be found on sale to commemorate the event. But it wasn't only souvenir vendors that jumped on the TDY bandwagon. Yorkshire folk, known for their thrifty natures, also have a keen eye for anywhere there is money to be made. The well-known Yorkshire saying, "where there's muck, there's brass" must have been at the forefront of a lot of farmers' minds when they realized the Tour would be going straight past their fields and that thousands of spectators would be cheering on the participants. Charging £20 a parking space and a pound to spend a penny, farmers transformed their fields into parking lots and campsites. Sheep were relocated to make room for $300 a night camping pitches and local hotels trebled their room rates. For most farmers though there wasn't as much gold in them thar Yorkshire Dales as they thought. Blame it on their marketing skills - or lack of. A simple sign saying "Camping" stuck in a field can't compete with on-line booking sites. Welcome to Yorkshire - the people responsible for...well I guess welcoming people to Yorkshire, tried to help one particular low-tech farmer who had contacted them complaining that that he wasn't full, despite being told that "hundreds of millions of people would be coming". Did he have a website? enquired the friendly Welcome to Yorkshire rep. No. Could he send them an email then so they could promote on their official website? "I don't do email", said the farmer. Talk about a field of dreams. Still for those who kept their prices reasonable and didn't subscribe to the Kevin Costner "if you build it they will come" marketing strategy, the weekend proved highly lucrative. 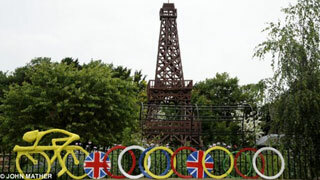 a make-over to celebrate the Tour de France. There were also plenty of locals who didn't try to make a bob or two out of the event, but were happy to simply mark the occasion in a variety of creative ways. All 19 pubs in the town of Otley for instance, translated their names into French; The White Swan became Le Cygne Blanc, the Black Bull, Le Taureau Noir, the Bowling Green, Le Terrain de Boules. In Burley-in-Wharfedale, girl and boy scouts helped a local family whose home sits along the route build and erect a 25ft. Eiffel Tower. While the people of the small village of Cragg Vale which is located at the start of the longest continuous gradient in England (over 5.5 miles) worked for over a year on to create a more than 7 mile string of bunting. Part of the record-setting stretch of bunting. Fashioned out of 59,939 flags made from curtains, tablecloths, aprons and the like which were sewn together by the villagers, the bunting was treated right royally. It even had its own HQ - the Robin Hood pub, whose landlord refused to serve anyone unless they'd painted a flag. With a Guinness World Record at sake, there was even a "bunting alert team" that published notices requesting visitors to phone in if they saw any flags sagging. And yes, the villagers' year-long efforts paid off; Cragg Vale is now the official holder of the World Record for longest stretch of bunting on earth. Residents in Masham might also have been up for a record had the council not made them remove from lampposts the over 20,000 miniature sweaters they'd strung up as bunting. For over six months, hundreds of schoolchildren and organizations from as far afield as Australia and the Arctic Circle had worked to knit 23,453 sweaters to welcome the thousands of visitors who were expected to visit their town. Then the real knit-wits stepped in. Citing "health and safety fears" the council hired a tree surgeon to remove the bunting, as they claimed the weight after it rained caused the lampposts to lean. As one resident pointed out "it's health and safety gone crazy. Sheep do not fall over when they get wet, so why should lampposts?" Talking of sheep - even they got into the spirit of Tour de Yorkshire. Although probably not willingly. 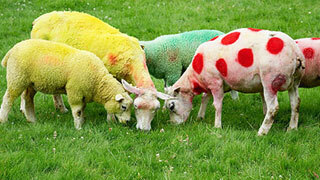 To mark the start of the race, a Harrogate farmer dyed his flock red, green and yellow to match the winners' jerseys. Riders were also treated to the sight of painted spotted llamas and yellow sheep as they passed through the towns of Reeth and Kettlewell.